Diagnosed with a rare form of tongue and throat cancer three years ago, she immediately said I will beat this, you watch. And watch we did, as she was trached, operated on, went through chemo and radiation, lost her hair, grew it back, lost weight, gained weight. All the while she fought to have a normal life, constantly calling on me to help her with her trache since I’ve had one for twenty-seven years. We would often talk late into the night about the joys and absolute horrors of having a trache, but we’d laugh our way through it. She was my niece, born when I was just twelve. We grew together—she spent more time at our home as she grew then she did her own. She shared my bedroom. It was much more than an aunt/niece relationship. She earned a respect for me when she went through her two years with the trache, I learned a new-found respect for her as she dealt with a devastating disease—all the while being bipolar. The highs were super, the lows deeper than anyone could imagine, but she fought hard. In December she was declared cancer free!! I cannot tell you the joy this family experienced. She threw herself into life with her children—five of them— and her seven grandchildren. She returned to the Cancer Treatment Center of America in Tulsa, Oklahoma, in March for follow-up. Again, cancer free. What a wonderful joyful moment for her and for us all. When she returned for another follow-up on July 18th, there were four small spots of cancer. The disease had returned, as it often does. She underwent surgery and came home on the 26th. She called me two days later to say how good she felt, the doctor thought he had “got it all” this time. She had been accepted into a college program to study criminal law. Life was back on track. The fighter was back in full gear and running at full steam ahead! The EMT put her on a respirator, started CPR, and got her to a hospital. She remained there, unconscious and unresponsive, until the legally required twenty-four hours passed and her children could shut down the machine. She passed quietly into the hands of the Lord ten minutes later, on July 31, 2011. She was a fighter, deserving of many trophies, but for her the time has passed. We are grateful she has found peace, but terribly sad that we must now live without her. 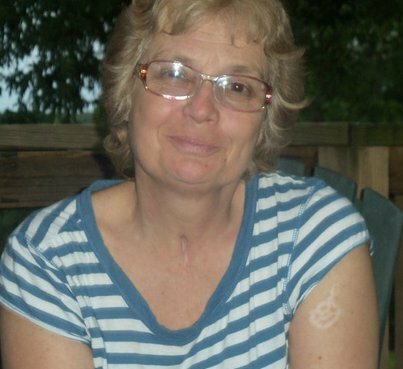 She was my niece, Debra Lee King (Himes), born 10/19/1959, died 07/31/2011.